Have questions? Need support? Ideas? Pick any app to go to its Help & Support center. A few months ago we announced the new features and licensing modes for Handyscan. Today we are adding more benefits to Premium/Business users. Before, a Premium user could purchase a pack of either 31 or 365 days. After time passed those packs expired, even if the app wasn't used at all during that period. This was not fair and a waste of money in case you only use the app rarely and not on a more frequent basis. So thinking about this we included "free services" on each pack. This means that you have guaranteed a minimum of "services" within your purchased period of time. A "service" is either a PDF conversion or a direct email sent with attachment (those actions who use our cloud platform). For example: You get the 1-month pack and after a month is passed you never created a PDF neither sent a scan as an attachment. In this case you will still have 60 free credits (not restricted to time) to make PDF conversions or send emails with attachments. By doing this we are ensuring a greater value to your money! 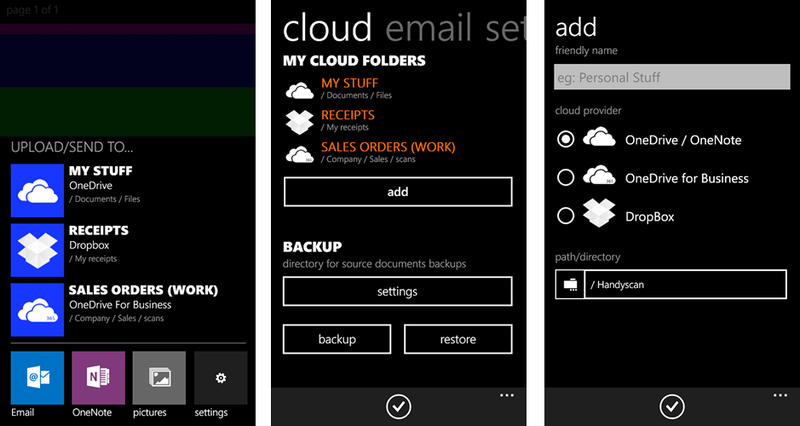 Also, when the pack expires, you will keep the other features as a full app (no Ads, upload to different clouds/folders, no pages limit per document, backup/restore, Office365 support). This will apply to all existing Premium/Business customers. For the rest, your are welcome to get Handyscan today. Social Scout and Booklet apps have been temporarily restricted due to changes in Facebook Platform and development API. As for Booklet, nearly 100% of the app became useless, so it now redirects to the traditional newsfeed mode. We are currently trying to get some kind of special allowance from Facebook Platform to be able to bring back the most of these apps functionality as we can. Want to thank for your continued support on the app and our sincere apologizes for this 3rd party decision affecting us all. Last month we released Handyscan version 4.0 under a new licensing model: Free app with optional payment for advanced features during a given period of time (month or year). More suitable for 'pro' or business users. It didn't make much sense by that time but it will do now with version 4.1, which is the first of a series of updates offering more powerful functionality for the pro/premium and business user: Multi-cloud setup, Office / Sharepoint 365 and OneDrive For Business support. Allows you and/or your business to create multiple 'cloud folders', which are kind of virtual directories where you can upload scanned files. Cloud folders can be from different providers; currently OneDrive, Dropbox and OneDrive For Business (Office/Sharepoint 365) are supported. So when you scan something you can quickly and easily pick any destination for the upload. As said above, there is now the capability to upload scans to any Office365 or Sharepoint subscription. You just sign-in with your credentials and it will work just the same as traditional OneDrive upload. This is even more handy for businesses or employees. 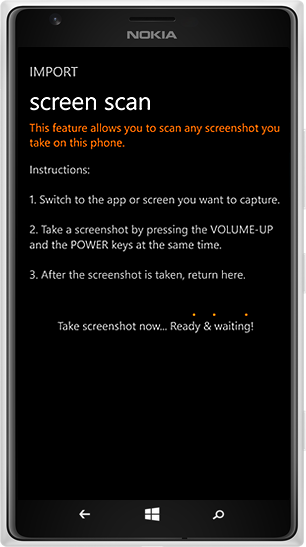 This new feature, available as well for free, allows you to scan your phone screen. Sometimes you want to capture a screenshot and make it part of a document, or crop it, or PDF it. You can now. Just as you "import" a picture from the gallery you can "screen scan" from Handyscan directly. There is more to come...! To all Social Scout and JDB Facebook users: We are redacting a petition for Facebook, regarding their recent decision of shutting down our Facebook app credentials making the apps unusable and your photos hidden for who knows how long. The petition will be posted on www.change.org and then will collect signatures to finally send it out to Facebook. We are asking you to help us redact the petition, correct any grammatical or syntactical error (English) as we are not native speakers. If you have any comments or corrections please post them here. We represent the group of Facebook users also owners of a Windows Phone and users of at least one the following Facebook apps: Social Scout (306100212828962) and Windows Phone Plugin (496999517009600). We exactly don't know the reasons why these two useful apps were recently disabled by Facebook, but that decision has caused something devastating for us: all the posts, check-ins and photos made through these apps are now gone. This is a huge amount of moments and memories shared throughout months. Shared with the desire to persist online over time and be there for us and any of our friends to see them. We trusted Facebook and trusted these apps, which are not evil at all. 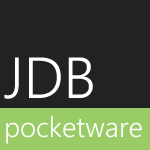 We do trust JDB Pocketware software as being a serious app developer for the Windows Phone platform. These apps allowed us to post photos in a very easy way and check-in very easily by using our Windows Phones. We hope you can allow us to have our photos back, along with the comments, likes, places and tags we and others put to them. We need your help now. So we can all get our photos back, please sign this petition to Facebook. Please share among your friends using our Facebook apps. A month ago we announced the beta version. Now after some testing, improvements and refinements we can say we have a 1.0.0 version. Tile'agram allows you to create beautiful diagrams made of a combination of tiles and pictures, and share them. Windows Phone users have liked this new concept a lot, while in beta it gathered reviews rating it 4.5 out of 5 in average for most markets. It represents the love users have for the "metro" style, unique for the Windows platform, and now thanks to this app "metro" can be part of our daily photos and posts; saying more and nicer in a single shot: the Tile'agram way. Added OS integration via "pictures > edit... > Tile'agram"
You can create diagram of tiles - Multiple colors - Multiple image effects - Multiple tile layouts & widgets - Tag people pr places - Add icons - Post to Facebook or your network of choice. No, this is not another Instagram app! But you can actually post your Tile'agrams to Instagram, Facebook or any social network you use. The app makes it very simple to create the diagram of tiles, it will even suggest tile layouts depending on the data you provide. Tile'agrams are created using information such as date, location, time, icons, profile covers, photos, etc. Let us know your feedback from the about section of the app or leaving a positive review on the store. Tile'agram is free with Ads but has the option to remove all Ads and unlock a few "premium" features for one single payment, from the About section in the app.